“Magical” is the word that most people use to describe Sylvia Tyson. Very few artists have created a musical legacy that has achieved long-standing international success. Sylvia became one of the music world’s most recognizable and respected names in the early 1960’s as half of one of the biggest music acts in the business. She then established a distinguished solo career, and is also known today as one of the Canadian vocal divas within the award winning group “Quartette”. 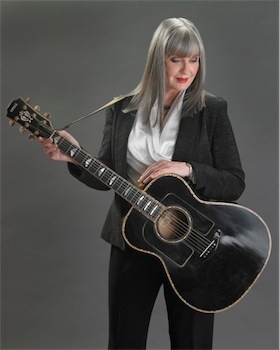 She has graced our country’s recordings for four decades, writing classic songs and making music that has made this Chatham, Ontario native an international star, and a Canadian treasure. As one half of the Folk Country duo “Ian & Sylvia”, she recorded 13 albums and helped change what the world was listening to. The album most revered today: “Great Speckled Bird” is now acknowledged as the beginning of a Country Rock sound that led to an evolution, still at the core of Country radio playlists. Sylvia Tyson is a recipient of the Order of Canada. She treasures many awards and is a member to the Juno Awards Canadian Music Hall of Fame. In the mid 70’s, Sylvia Tyson went on to release many critically acclaimed solo albums and host award winning radio and television programs such as the Roots series “Touch The Earth”. With three of Canada’s purest voices today, (Caitlin Hanford, Cindy Church, Gwen Swick), Sylvia performs as a member of “Quartette” and also continues with solo projects, including her much lauded one woman theatrical tour: “River Road & Other Stories”. Sylvia Tyson is credited in helping give Canada its classic ‘Folk’ sound and this wonderful (Canadian) singer songwriter has helped shape our incredible Canadian musical history. Thousands of fans throughout the world grew up with her beautiful image and her sweet voice. She is a testament to Canada’s cool, laid back, County-Roots beginnings. Sylvia Tyson’s induction to the Canadian Country Music Hall of Fame is in recognition of her outstanding achievements as an artist and her tremendous contribution to the music industry internationally.